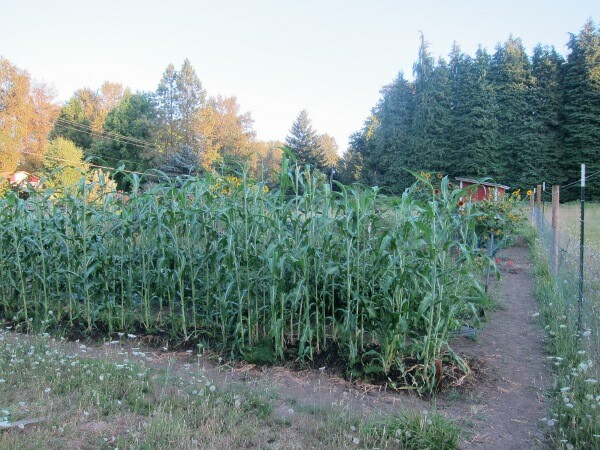 This has been our most successful garden to date. Crops which failed for us in the past have been thriving and past successes are bigger than ever. It’s also been the first time in four years that Lee wasn’t completely stressed out by the garden at the beginning of June. 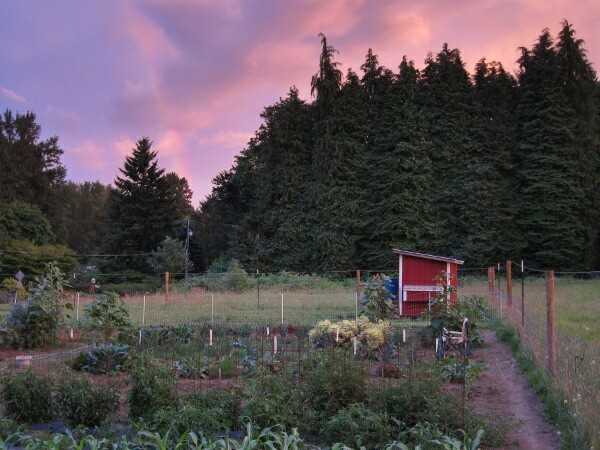 The reasons for our successful gardening season seem to be a combination of good weather, early weed control, and more experienced gardeners. We spend a little less time being puzzled by every problem, and have already started talking about the changes we will make next year to further simplify our efforts. The picture below shows Lee standing by the potato rows. These are the most lush and tall potato plants we’ve ever grown. 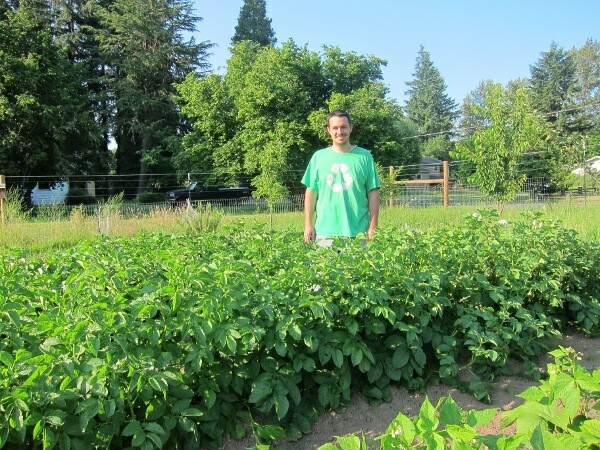 Lee is super excited that all that plant growth will translate into lots and lots of potatoes. They are ready to be harvested now. Last year the pollination for some of our crops was lacking. 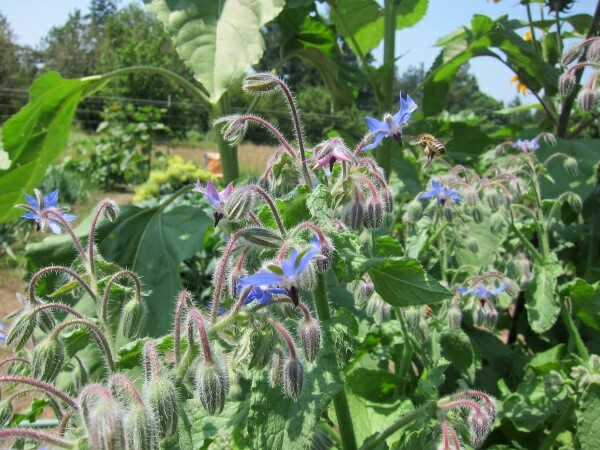 I planted Borage this year to attract more bees into the garden. The bees seem to like it–I always find them hovering about. I have been very impressed with the Borage and plan on including it in the garden next year. It is still blooming and also producing seeds, which I have started to collect. What seems to work even better than Borage for attracting bees is flowering broccoli. 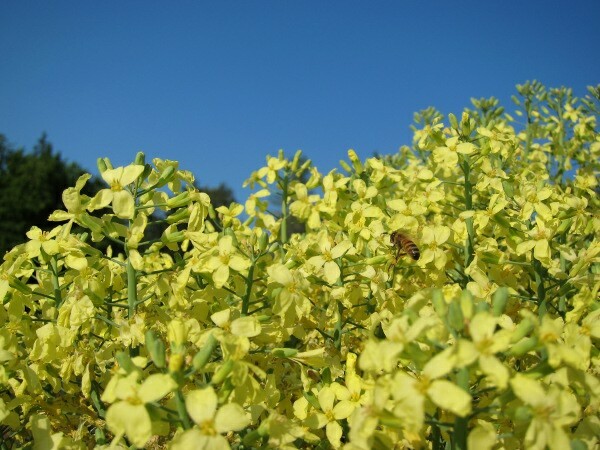 Several of our broccoli plants got away from us and turned into a huge mass of yellow flowers. The bees were in LOVE with it. I’ve never seen so many bees in one place. We didn’t defeat the cucumber beetles, but our plants eventually just outgrew them. The one upside was that our squash and pumpkins set lots of fruit, so I think the evil leaf munchers were providing the pollination for us. (They like to congregate in the flowers.) The squash plants are literally taking over a quarter of the garden. They have spread into the adjoining potato and sunflower rows and are growing out across the grass into the orchard. 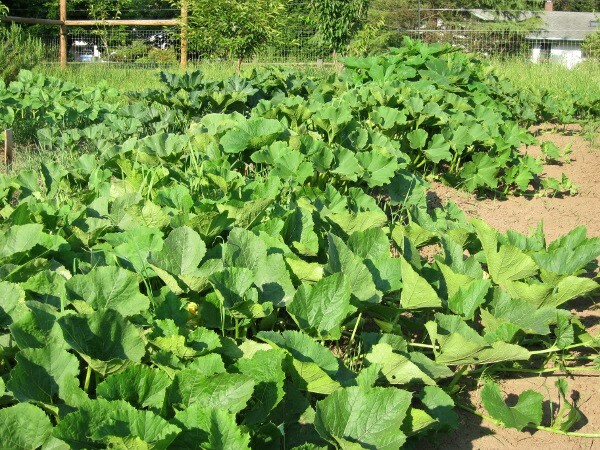 It is impossible to walk between the two squash “rows” or see the label stakes. Recently I saw some black-looking squash for the first time in among the foliage and remembered that I had planted acorn squash too. 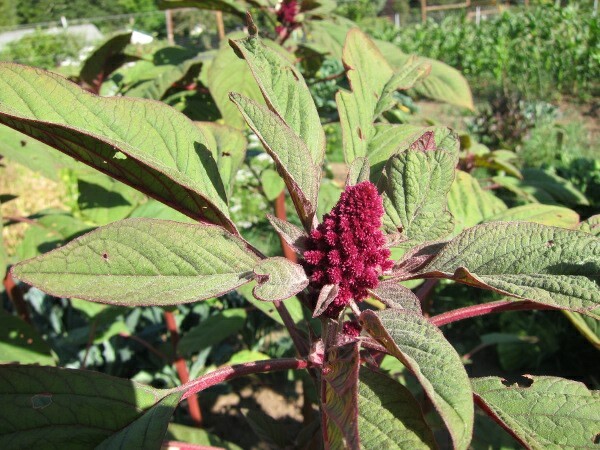 I planted Hartman’s Giant Amaranth this year. It’s beautiful and hopefully we get a nice quantity of seed from it. 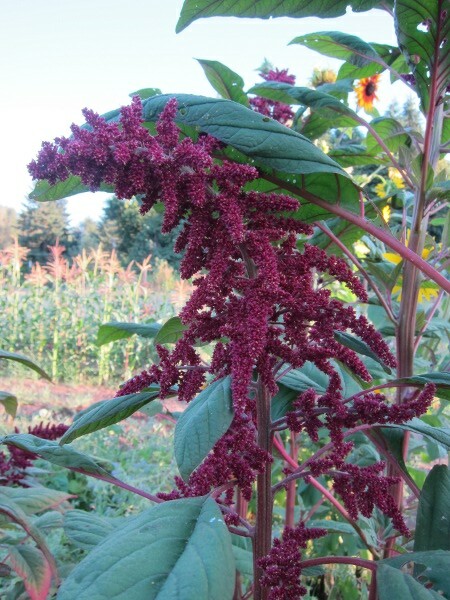 I would love to plant several full beds of amaranth next year and use the seed as chicken feed. The official sunflower patch is quite interesting. I planted them all at the same time, so it has been fun watching how tall each variety grows and when they bloom. About half of them are still growing. The tallest variety so far, Lemon Queen, is over 9 feet high. The peppers seem to be doing well for an Oregon summer. We tend to have good success with hot peppers but fail at bell peppers. 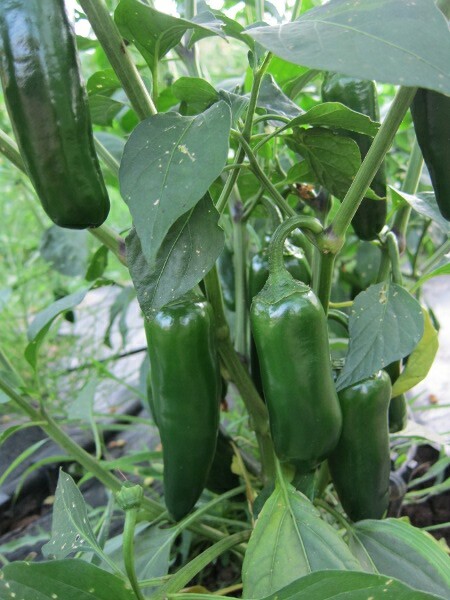 This year we grew smaller sweet pepper varieties instead of bell peppers, and that was a good decision. Lastly, I was given a free seed packet of Love In A Mist. I put the whole packet in one row (because I didn’t think any of them would sprout) and it looks like every last seed decided to germinate. I was shocked, but then I never got around to thinning them out. They somehow managed to grow anyway (but to a reduced height), and then bloom away like they didn’t care about their cramped conditions. They are supposed to self seed, so I hope they come back next year. If they do, I will thin them out so they can grow bigger. Have so enjoyed following your blog. Great garden. You have come a long way! Thanks. Thank you Barbara. I’m glad you enjoy the blog. Lee doesn’t know it yet but I am seriously considering kicking the chickens out of the garden next year so I can expand more. Rahahaaaaa. Beautiful garden. You have had great success. Everything looks awesome, kudos to you both! Your potato plants looked particularly spectacular. Can’t wait to see what you dig up! Lee dug up the Yukon’s on Sunday. We haven’t weighed them yet though. 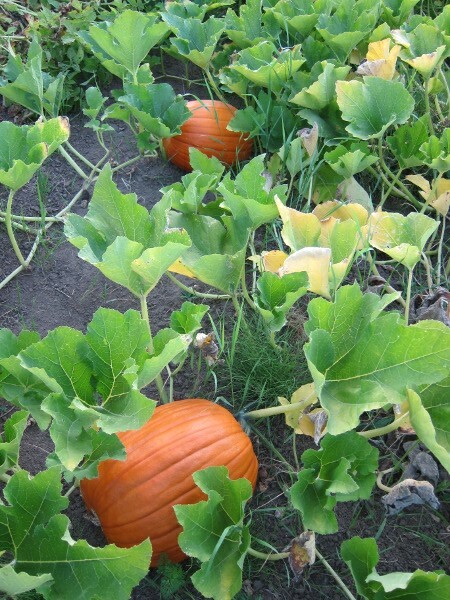 The other varieties aren’t ready to be harvested. Lee made me some lovely twice baked potatoes with the Yukon’s and they were delicious! nice! 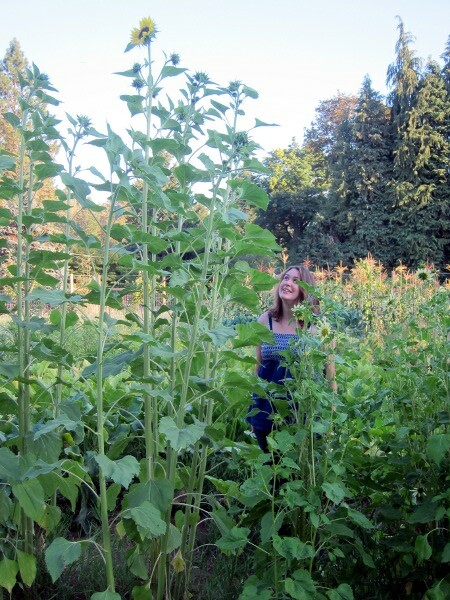 that is one impressive garden!..and those sunflowers are redonkulous! The sunflowers are redonkulous! lol. There are so many sunflowers around the garden that I’m not sure we are really growing vegetables. It’s pretty to look at though. Congratulations on a beautiful garden this year. It looks like it is going to be a great harvest, and you’ll be tasting memories of the summer in the freezing gloom of January and February. 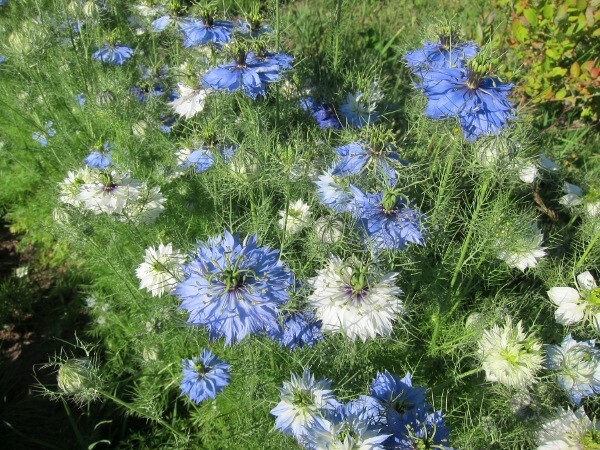 I didn’t realize those blue flowers were called “Love in a Mist” … my mom always called them Bachelor’s Buttons. They do self-seed though. Almost to the point of being weeds. 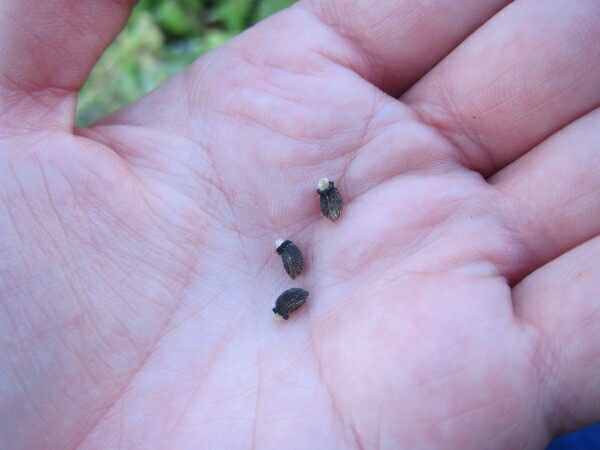 They would sprout in random flower beds, in cracks in our sidewalk and driveway, next to our tomatoes…everywhere. They are really pretty though!